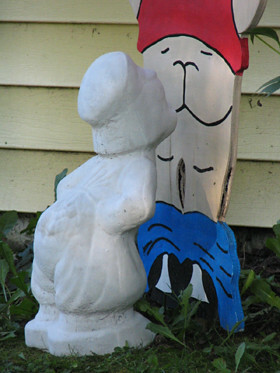 Here's another entry for my Kissing Dutch Boy photo project (originally posted 7/18/05). It's a known fact every artist has to sacrifice for their art. In my case I've sacrificed my dignity for this project. It ain't easy knocking on some stranger's door asking to get photos of their yard art in this context. That being said I have to give a special shout out to the lady who agreed to let me photograph her hand painted yard art with the kissing Dutch Boy yard sculpture. DOOOOOOOOOOOOOOOOOOOD! I mean REALLY DUDE, even by my lack of standards. But I did have to comment, so ya must be doin somethin wrong. Apparantly my inner child is a disturbed seventh grader. Photo Friday Submission - "One"